Applicable to skin sterilization and bacteriostasis.Such as staphylococcus aureus (rotting aureus), candida albicans (fungus). Acute or chronic dermatitis, eczema, tinea manus (Hong Kong foot, fungal), body tinea (sweat stain), psoriasis, peeling, blister, bad feet, the feet itch, pruritus vulvae, hemorrhoids, mosquito bites, acne, prickly heat, itchy skin. External use, the right amount of this product to put on the skin to wash affected area, 2 to 3 times a day, can be used again one to two weeks after symptoms disappear, to prevent recurrence. Sealed, placed in a cool dry place. 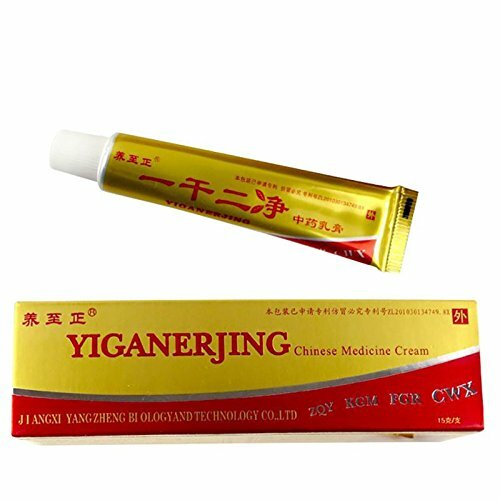 1 X Chinese Herbal Medicine Cream. 1. This product is for external use only avoid is oral, not used for large area wound surface. 2. Children should be used under the supervision of adult. Applicable to skin sterilization and bacteriostasis. Is suitable for all skin. It is easy to carry out.